Ducati's XDiavel was a revelation when it hit the cruiser market back in 2016. Boasting a superbike-spec full fat 156bhp Testastretta V-twin powerhouse, the elongated Duke is very, very fast and quite firmly sprung but rarely harsh. Offering handling and composure to match any roadster, the XDiavel offers a comfortable cruiser environment, without any of the slow, ploddy character of some of the bike's rivals. Taking the fight directly to the likes of the Triumph Rocket III, Yamaha V-Max and Harley-Davidson V-Rod, the Ducati offers arm-ripping torque by the bucket load alongside great handling and masses of stopping power, thanks to its top-spec Brembo M50 calipers (available on the S model). Along with this, Ducati also offer three different handlebar options, five different seats and three footrest mounting points which they say offers so many ergonomic options for maximum comfort. Make sure the one you buy is set-up for you! A low seat height is just 755mm also offers even those of a shorter leg the option to be able to get feet onto the floor easily, too. 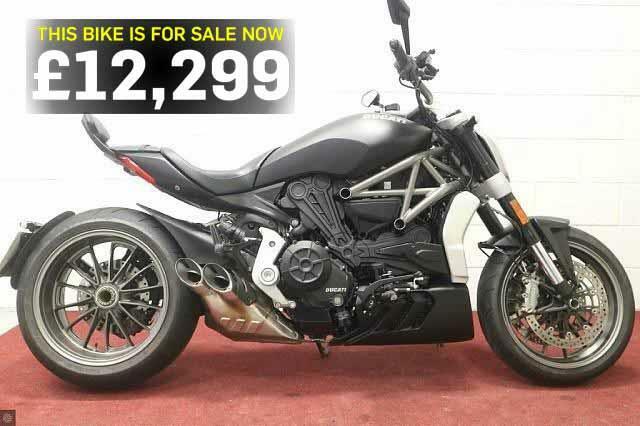 "For sale is this 2016, 65 plate, 6027-mile Ducati XDiavel. Finished in Black, this low mileage example is in very nice condition and comes with the owners manual, service book and has a fully documented service history. "All keys are also present with the bike. It has launch control, traction control, power modes, keyless start, LED lighting complete with DRLs, cruise control, a pillion back rest, Brembo brakes, Datatag and adjustable suspension. "What's more, it will also come with a full 12 month MOT when purchased. Finance is available, too."